Have you tried them yet? No? Get to it! 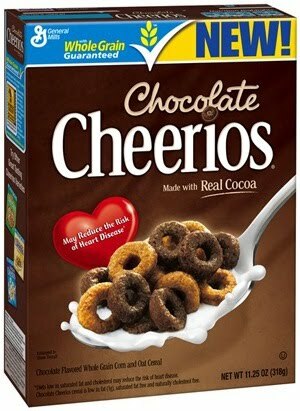 I'm slightly smitten by the new Chocolate Cheerios. On the days when I pretend to watch what I'm eating, I snack on cereal.. and Chocolate Cheerios satisfies my chocolate craving nicely. It's 100 calories for every 3/4 cup, which is decent enough. It's not annoyingly sweet like Cocoa Pebbles and you still get a lot of corn flavor that counteracts the sweet chocolate taste.